The action bar is located in the top center part of the Details page. When a compound is ready to be modified, by clicking on the [Amend] button, the amendment process is initialized. The [Amend] button is active for the execution of a modification in the chemical structure which can also include the modification/adding/removal of a CST, isotope, charge or salt/solvate information, or even to add or change additional data. With the aid of the [Amend] button structure type changes, like modifying a single type compound to a multi-component compound or adding/eliminating components to/from multi-component compounds can also be finalized. The action items from the [More actions] menu are specific to each level of the registered compound tree. History is designed to keep track and summarize modifications of a tree element from its initial registration. A parent compound along with the entire tree (version and lots) can be deleted. If you attempt to delete a PCN, which is also a component of a multi-component compound, a warning window appears with "Delete operation failed" message. A deleted tree can be restored by using the Undelete action from the Administration page. In the Compound Registration system the restriction level of a compound by default is set to 0 and the record is considered unrestricted. A different restriction level can be manually set here, or it can be inherited automatically during autoregistration or when accepting a restricted match on the Submission page. When setting a restriction on a parent level, it is automatically inherited by the whole tree. In case of restricted trees, the user will always be warned when accessing the tree from the Details page. Restricted trees are not visible for the users who doesn't have the role for this. This feature can be applied when the user prefers to display the whole tree (parent, versions and lots) with the same arrangement of the structure. The [Update Layout] button is available only for single compounds on parent level. It is not active for multi-component compounds, though the displayed fused images of the multi-component compounds will be renewed if the component structures are updated. However the stored structures of the multi-component compounds will still remain the same. E.g. when a preparation has been registered for first time, the arrangement of its chemical structure will be inherited by its version and parent. The fused images of the following versions having only different salt/solvate information, but the very same chemical structure, are also based on this first representation. However, versions containing new isotope(s) and/or charge(s) are registered with their actual arrangement of their structure, which might lead to a tree having structures with different arrangements. Applying the Update Layout, after a structure was modified, results in an updated tree from the structure point of view, since all versions and lots will inherit the same new arrangement of the structure. Click on the Update Layout. A Summary window appears displaying the new arrangement of the structure. This modification is considered as an "Update Structure Molfile" operation in the Summary / History / Audit. A user-supplied (specified) molecular weight can be set for the structure. Choosing the [Change Mol Weight] item, the Change Mol Weight window will open, where a new value can be set and saved as user specified MW for the selected structure. The operation is stored in the history as an Update structure. Beside the specified MW, the calculated one is also displayed for the parent, version and lot (see the Details section). A version element along with it's lots can be deleted. 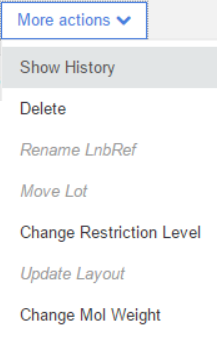 A deleted version with the lots can be restored by using the Undelete action from the Administration page. A restriction level can be manually set here, or it can be inherited automatically during autoregistration or when accepting a restricted match on the Submission page. When setting a restriction on a version level, it is automatically inherited by the whole tree. A lot element can be deleted. A deleted lot can be restored by using the Undelete action from the Administration page. LnbRefs can be changed here. Lots can be easily moved within one tree or to a different tree. 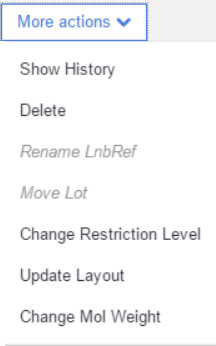 When choosing the Move lot option, a Move lot window will appear, where a version number (CN) should be given, then click on the search button. 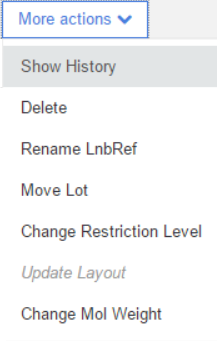 If a new version is accepted for the lot to be moved, click on the [Move lot] button. In a move lot action, the moved lot (LnbRef) will inherit the specified MW, the Stereochemistry and Geometric isomerism additional data of the new version (in case if there is one). The moved lot will keep it's original Project info and Comment (in case if there is one). To set a user-supplied (specified) molecular weight click on the [Change Mol Weight] item and the Change Mol Weight window will open, where a new value can be set and saved as user specified MW. The operation is stored in the history as an Update structure. Beside the specified MW, the calculated one is also available for the parent, version and lot (see the Details section).